On Friday Steve and I had the honour of being invited to the Tice’s Meadow Opening Ceremony marking the completion of the quarry restoration. The event hosted by the site owners Hanson, was well attended with over 40 representatives of organisations who have contributed to the nature reserve we enjoy today. The post-gravel extraction vision for the site was originally set out as restoration to farmland. Thanks to the effort of organisations including BVCP, the potential of managing Tice’s Meadow as a nature reserve was discussed as the restoration plan evolved with our partners. 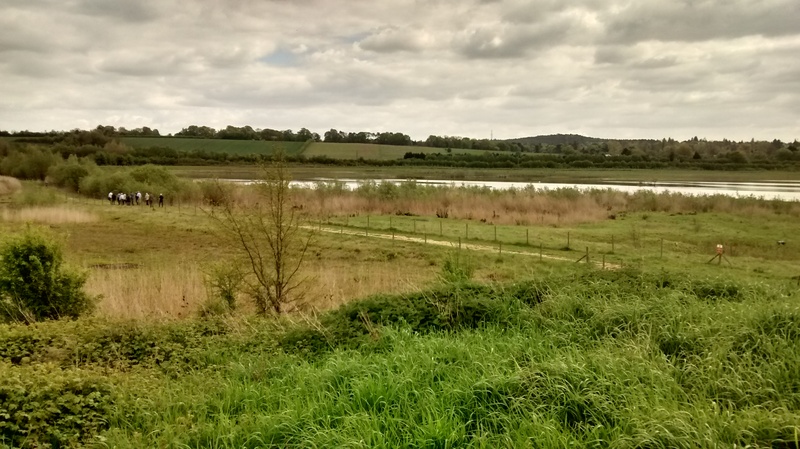 For example, instead of filling in the meadows and grass seeding, we played an important role in highlighting the benefits of retaining the ephemeral lake and wet grassland, which plays a key role in making Tice’s Meadow a regionally important site for bird biodiversity. Also the lake and newly created meandering River Blackwater channel contribute to flood protection downstream, by reducing peak water flow and acting as flood storage. The event coincided with the Bio Blitz hosted by the Tice’s Meadow Bird Group who take the lead with managing the site and surveying the biodiversity . It was a great opportunity for TMBG to show off Tice’s Meadow with guided tours to show everyone round. Thank you in particular to Richard and Mark for their invaluable hard work improving the site. Over the year we’ve been busy down at Tice’s Meadow installing two new pedestrian bridges, and supporting the TMBG on smaller projects including; helping restore tern rafts, installing a memorial bench, reptile habitat work, tractor mowing and hosting our Christmas BBQ task. During the presentations both Andy Duncan from Hanson and Simon Elson from Surrey County Council, thanked Steve Bailey our BVCP Manager for his instrumental role in the evolution of Tice’s Meadow. It’s fantastic to see his collaboration and expertise recognised on this rewarding project. This entry was posted in Conservation, Events, Tice's Meadow and tagged Blackwater River. Bookmark the permalink.